Subway Thank you! | CV Inc.
CV, Inc. has implemented a Wellness program which has been in affect since 2014. We try to nourish ourselves not just mentally, but also physically. Eating healthy is one of the aspects of the Wellness program. 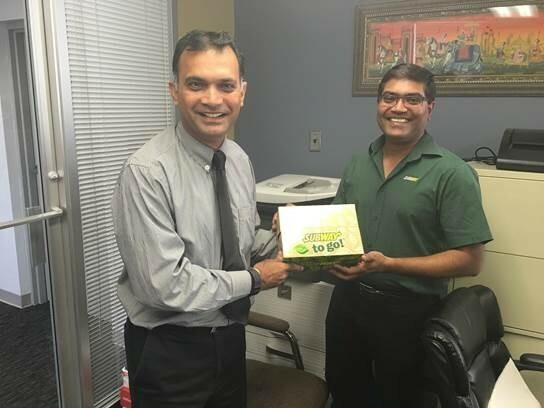 We had the pleasure last week to meet Jignesh Sukhadia from the Silver Spring Subway. He explained the nutritional benefits of eating fresh and healthy and how Subway can help satisfy our nutritional needs. Thank you Jignesh for taking your time to come in and educate us on nutrition and better eating habits. I have to say the lunches you brought were 1st class and we will definitely continue to order from you in the future. Thank you from the Rockville CV, Inc. employees!